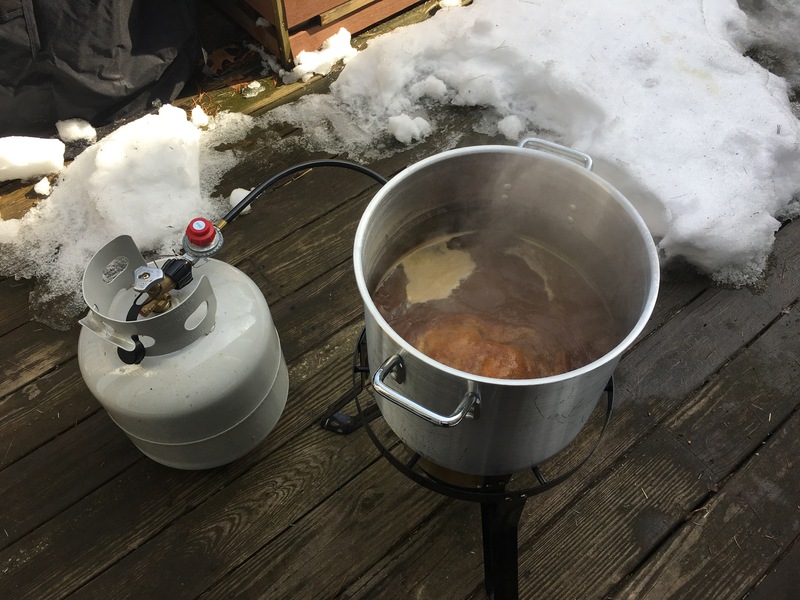 The snow was still on the ground but I had an empty keg to fill so I needed to get some brewing done. I had an Azacca Pale Ale extract kit from Northern Brewer in the house and decided to start the glorious process. It will take a little over a month for this to become wonderful beer but might as well get started now! As this is my first beer post, I’ll go into some detail around the equipment and techniques. The first step in any brew session is to assemble your gear. You have your brew kettle (big pot), your fermenting vessel (big glass bottle), and a bucket (big bucket). Most of what you see here is from Norther Brewer out of their Deluxe Brewing Starter Kit. The brew kettle isn’t included but a restaurant supply store is great for that. I’ve also added the outdoor propane burner sitting under the kettle – got mine for cheap at Ocean State Job Lot. You don’t need one of the specialty ones in my opinion. Last thing extra is the carboy (big glass bottle) carrier which I got from Amazon. Some people prefer these Baby Bjorn looking things for carrying carboys… certainly a useful alternative but the handle does well enough for me. The once you have all your equipment in place, you start the boil. The boil is usually 60 minutes and includes the additions of malt and hops at various intervals. These differ for each recipe and the Northern Brewer kits do a great job of laying this out. Simple enough to follow, even for a beginner. With many kits (as with this Azacca Pale Ale) there are specialty grains. These grains steep in the water as it is coming to a boil – much like a tea bag. They lend color and flavor to the final output. In this case I didn’t snap a picture at that stage – will have to do so in the future. This Azacca Pale Ale was a single hop recipe – meaning that it only had one type of hop even though there are multiple additions. I don’t believe I have had a beer with just Azacca hops in it before so I’m excited to try it. One I had added all the malt and hops at the proper timings, I killed the heat (also known as “flame out”) and brought the kettle inside. At this point you have to cool the solution (now called “wort”, pronounced like “dirt”) as quickly as possible. It is also important to that everything that touches the wort from now on must be sanitized. Most folks user a contact sanitizer like Star San. This type of product doesn’t need to (and shouldn’t) be rinsed. It creates a lot of bubbles at times but as I read somewhere don’t fear the foam. 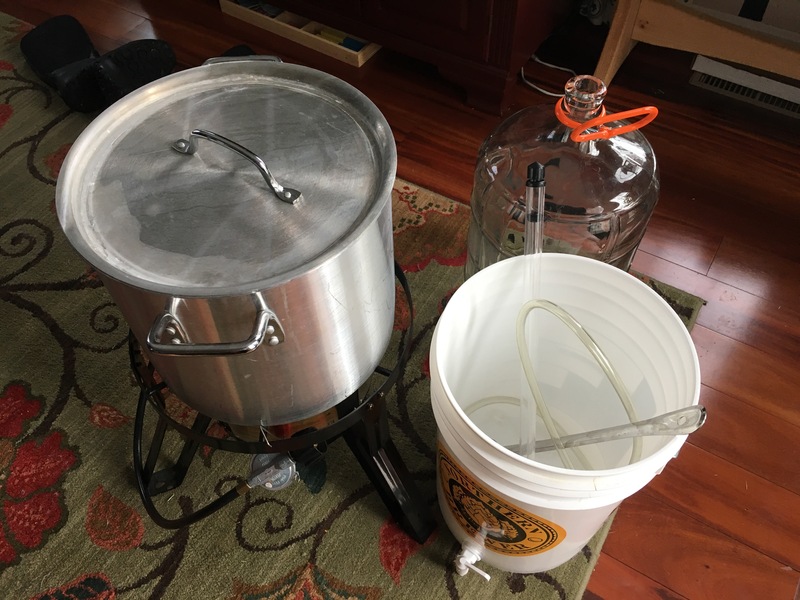 I make a few gallons in the bucket and use it to sanitizes the carboy, siphon, airlock, yeast packet, scissors for opening the yeast packet, and anything else that might touch the wort. The goal here is to to make everything clean enough for surgery but rather to kill wild yeast. Rebel yeast can introduce off flavors and other qualities that have generally been bred out of brewers yeasts. Picture on the left is the wort right after the yeast were added. Picture on the right is after about 24 hours. The dense foam at the top is known as krausen and is formed by the yeast doing their job. Definitely a good sign. I love brewing beer. It is a nice, relaxing activity that helps fill the time when I can’t be out hiking. And the output is delicious!